It is official. Robots are taking over the world. Or in this specific case, Robotic Lawn Mowers are. Gone were the days where you had to spend hours mowing your lawn or using an expensive mowing service. Robotic Lawn Mowers do all the hard work of cutting the grass while you can spend away your free time doing something you love. In addition to them being fully automatic, most of the Robotic Lawn Mowers emit very low sound compared to the traditional lawn mowers. Modern Robotic Lawn Mowers come with cool features like self-docking to recharge, weather sensors (rain sensor etc), anti-theft protection, custom apps etc. While early day Robotic Lawn Mowers were expensive, their prices have come down a long way with much more sophisticated feature set. If you are tired of mowing your lawn with traditional lawn mowers, Robotic Lawn Mowers are very good alternatives for your piece of mind. Follow us as we give an overview and compare some of the Best Robotic Lawn Mowers that you can buy right now. Worx Landroid should be the default choice if you are converting from traditional Lawn Mowers to Robotic Lawn Mowers for the first time. 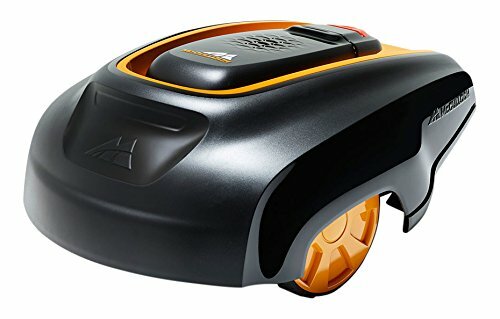 This entry level Robotic Lawn Mower packs most of the features you would expect from a Robotic Lawn Mower and can maintain grass for lawns upto 1/4 Acre. You can set up Worx Landroid easily out of the box with its user friendly interface and choose the schedules on which the Worx Robotic Lawn Mower should mow the lawn. When it is low on charge, the Worx Landroid returns to its charging station. While Worx Landroid is not water resistant, it has weather sensors. During the time of rain or any other such weather conditions, it goes back to its charging station. Once the weather is dry again, it automatically resumes operation. Worx Landroid’s safety features comprise of tilt/lift auto-shutdown, anti-theft alarm and pin enabled lock. For the first timers, Worx Landroid is a perfect Robotic Lawn Mower to buy and hence it is our #1 Best Robotic Lawn Mowers. Robomow is one of the popular brands in the Robotic Lawn Mowers. Their RS series of Robotic Lawn Mowers are high end and are built to mow lawns faster with stronger cutting system. Robomow is known for their customer focus and provides 1 year warranty on all their products. Robomow RS612 mows lawns with maximum size of upto 1/4 acre. For lawns of higher size Robomow RS622 (1/2 Acre) and Robomow RS630 (3/4 Acre) are recommended. Robomow RS612 comes with a mobile application and can be configured easily. The biggest selling factor of Robomow RS series Lawn Mowers is their cutting width. At a cutting width of 22inches (in comparison, Worx Landroid’s cutting width is 7 inches), the Robomow Robotic Lawn Mower can cut grass at a much faster rate. Robomow Robotic Lawn Mowers have a modular design. So, you don’t need to worry about replacing the entire lawn mower but can quickly replace a part if at all there is any downtime. Robomow RS612 comes with regular safety features like pin code, child lock etc. Since Robomow RS612 doesn’t offer water resistance, it also has an integrated rain sensor to save the device from rain. It can self-dock for charging and the schedules can be managed by the mobile application. Robomow RS612 is the best full-featured Robotic Lawn Mower and is a recommended choice at number 2. The only con of the product is that it is almost double the price of Worx Landroid. Husqvarna is a company that has been creating Robotic Lawn Mower’s since 20 years. With their wide range of products, they have become a trustworthy brand in Garden Tools domain. Husqvarna has a range of Robotic Lawn Mowers of which Husqvarna 315 is one of the great products. Husqvarna 315 lawn mower can mow upto 0.37 acre and comes with a myriad of features. The Husqvarna 315 Robotic Lawn Mower can work in extreme temperatures. Its standout feature is rain resistance. Unlike other common Robotic Lawn Mowers, Husqvarana 315 can continue its work in conditions like rain. Hence, it is an ideal product for people who live in harsh weather conditions. Husqvarna provides 2 year warranty on their product and the product can be customized to different colors with replaceable top covers. It comes with customizable setup and is easy to run on schedule. While the cutting size of Husqvarna 315 is small, its cutting technology cuts just a little but frequently ensuring nice and healthy lawn. It does come with safety features like theft protection through alarm and pincode, child lock, balance control etc. What gets going for this product is its ability to work in harsh weathers and the support for higher slopes and highly configurable grass height. Rob 1000 is a well-priced Robotic Lawn Mower from McCulloch, a company that is known for Garden products for 75 years. Rob 1000 is designed to mow lawns to the size of upto 1/4 acre and is easy to setup. The standout feature of Rob 1000 is its ability to work in rainy conditions. Rob 1000 is fully programmable and it actually feeds the lawn. Unlike other mowers, Rob 1000 doesn’t collect the grass. Instead it creates micro clippings of grass that turn to mulch and feed the lawn. This helps in making the grass thicker. Rob 1000 comes with regular safety features like pin code, theft alarm and shift/tilt shutdown. Its can auto-dock for charging and run on a schedule. If you are impressed with Worx Landroid for its price and features but are disappointed that it doesn’t work in rainy conditions, Rob 1000 Robotic Lawn Mower is a good alternative. Rob 1000 is a bit pricier than Worx but provides extra features on it. Robomow RX12 Robotic Lawn Mower is designed for a very specific use case. If your lawn is less 1/20th of an acre (around 2000 sq.ft), Robomow RX12 is a good option for your automatic lawn mowing needs. It is priced well (around half of Worx Landroid) with focus on all essential functionality. Since RX12 is from Robomow, one of the leaders in Robotic lawn Mowers, you can always trust on its quality. Like all other Robomow products, RX12 comes with 1 year warranty. Its mowing width is 7 inches and can cut for slopes upto 8.5degrees. RX12 features a modular design and hence parts are easily replaceable. Go for this product, if you are on a budget, have small lawn and are looking to buy your first Robotic Lawn Mower. Growlers 101 : Are they just fancy bottles that are used to carry beer?